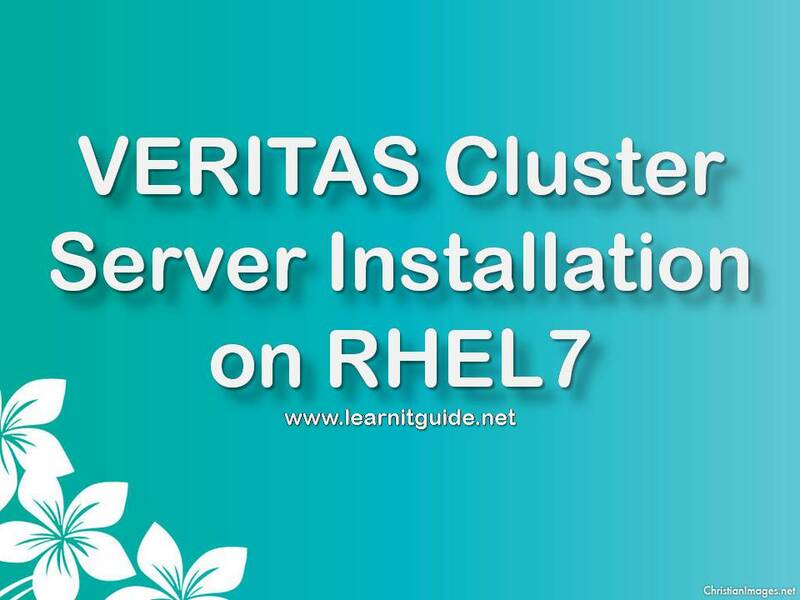 This article shows you how to install Veritas Cluster Server (VCS) on RHEL7. Installation of Veritas Cluster server on RHEL7 is similar to install on other old release of RedHat. In the next post, we will show you how to configure two node Veritas Cluster Server on RHEL7. 3. Yum repo enabled using ISO media to install required OS RPMS. 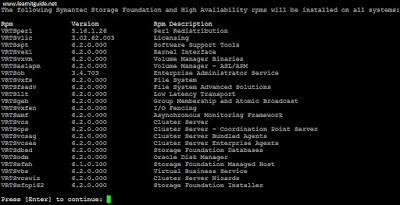 Requirements to install Veritas Cluster Server on RHEL7. Step involved to install the Veritas Cluster Server (VCS) on RHEL7. 4. Installation of Veritas Cluster Server (VCS) on two nodes. 1. Download Symantec Storage Foundation with High Availability 6.2 (Veritas Cluster Server). Go to Symantec.com website and Signup free to download the Symantec Storage Foundation and Veritas Cluster Server 6.2 for linux or click here for the direct link to download. Note: Now its been moved to Veritas company, So checkout this link youtube video with full instruction. Also you can find the recent link of Veritas Infoscale here. I have copied the downloaded file VRTS_SF_HA_Solutions_6.2_RHEL.tar.gz into the server node1 under /var/tmp. Extract the downloaded package and run the installer as shown in the image. Run the installer file as shown in the image and start the pre-installation check to ensure all requirements are done to continue the Installation of Veritas Cluster Server on RHEL7. When you run, it will prompt with many options as shown in the image. Press "P" to perform a Pre-Installation check before installing the Veritas Cluster Server on two nodes. Select "4" to choose the product "Symantec Storage Foundation and High Availability (SFHA). Enter the Node names of the server on which we are going to install veritas cluster server. here we give our node names as "node1" and "node2" as shown in the image. You can give other nodes as well with space if you planned to configure more number of nodes. Once enter the node names, installer will check the system communication between these nodes. Either ssh or rsh needs to be set up between these nodes for communication. To setup either one of this, root password will be asked. Press "y" to agree to give the root password of other nodes. Once you entered the root password of nodes, this will prompt to setup either SSH or RSH t enable the system communication. Press "1" to choose the communication method as "SSH". Again installer will start checking the pre installation check and will show you the status at the last column. Sometime it may report you as failed because of missing rpms and also that will give you an another option to install via yum or manually. If you have yum server then select "1" to install the missing required rpms with yum. Please refer this link to configure the yum repo server on Linux. Even if you are getting the errors as rpms are missing and failed to install with yum. Try to install the package manually, you could identify the issues. Sometime it may get failed for keys and below solution was helped me to fix it. Again start the installer and do the steps from beginning. Once everything shows as "done", you could see the messages as "Precheck report completed" as shown in the image. Installer will ask you "Would you like to install SFHA on node1 and node2", Press "y" to install and again press "y" to agree the terms and conditions as shown in the image. Now press "2" to install the recommended rpms on all nodes. Installer will show you the list of RPMS to be installed on all nodes. Press "Enter" to continue. Once all the packages are installed as shown in the image, it will prompt you to enter a valid license. If you have, Select "1" and give the valid key. If not, select "2" to enable keyless licensing. So here we choose "2" as shown in the image. Select the product mode "1" to choose "SF standard HA" and choose "n" to disable replication options. Once keyless license registered on all nodes, installer will prompt choose yes or no to configure the Veritas Cluster Server. If you want to continue configuration of veritas cluster server, give "y" to configure on all nodes, if not give "n" to finish the installation only. We will explain you the Configuration of Veritas Cluster server on RHEL7 in the next post. Press "n" to skip the cleanup on other nodes and press again "n" to not view the summary file. Thats all about the Installation of Veritas Cluster Server on RHEL7. In the next post, we will show you how to configure the Veritas Cluster Server on RHEL7.